In the last few days, I shared with you some of our latest insights on facebook and twitter via a number of video posts: I’ve confirmed that only 0.05% twitter accounts in financial services are verified, and 90% of those same twitter accounts are inactive. Now, I will share my thoughts and recommendations on one of the key challenges on facebook for financial institutions: driving engagement via an open wall. Surprisingly, we found that the majority of facebook pages in financial services are ‘open’ and ‘at risk’… find out why, and what to do to lower the level of risk. I invite you to watch my video where I talk you through an excellent example from South Africa, the Top 20 most liked facebook pages with an open wall (globally), a few moderation guidelines. 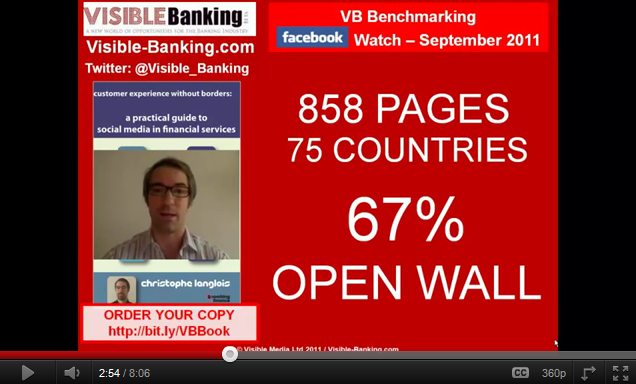 Please note that this video is available on the Visible Banking YouTube channel. Companies mentioned: ABSA, Bank of Melbourne, Bank of the West, Commonwealth Bank of Australia, first direct, Progressive Insurance. Top 20 most liked pages with an open wall: Allstate, Bank BGZ, CIMB Malaysia, Farmers Insurance, Finansbank, Garanti Bank, GEICO, Interbank Perú, Progressive Insurance, Interbank Perú, PayPal, Popular, Sparkasse, State Farm Insurance, USAA, Visa.